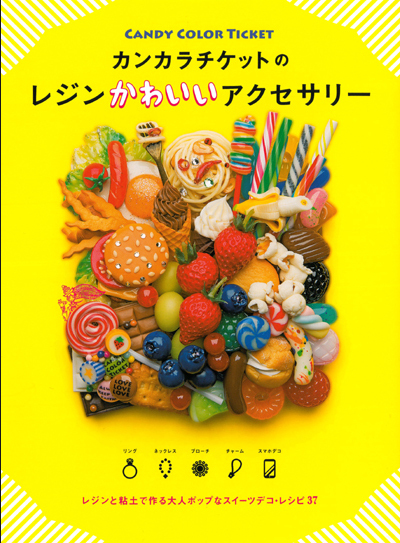 This is an excellent clay food jewelry book written by a famous Japanese artist Candy Color Ticket. Featuring over 16 items, you will have a blast experimenting with all of them. Some of the key novelty items include colourful candies, hamburger, fries, spaghetti, sunny side up egg and pop corn! Suitable for intermediate to advanced crafters, this comprehensive clay food features air dry clay techniques as well as the newest resin liquid and molding techniques. Turn these treats into dollhouse miniatures, wearable jewelry or even as decorative household items. Book is in Japanese language, but you will be able to follow as all the steps are provided with full colored photos. Full coloured high quality pages. A total of 79 pages. Hamburger, hamburger fillings (meat, vegetables, cheese etc), eggs, fries, pop corn, spaghetti, chestnut, profiteroles, gummy sweets! Shipping for this item will be US$5.50. Shipping price will be included in the paypal invoice. Book will be shipped in a hard back envelope. It will be shipped separately if you purchase other items. Additional shipping fee may be charged separately for the other items if you purchase them altogether. If you are new to my shop, it is advisable to look at my shop policies here.